The final season of Game of Thrones approaches and we can safely say this is the biggest event in modern TV history, perhaps the last of these watercooler shows we will ever get now that binging is the preferred way of watching. What we cannot safely say is anything that will happen. And to that end, who will win the Game and take the Iron Throne is the question everyone is asking. Will Dany and Jon fulfill their destinies, bringing a broken world back together side by side? Will Cersei concoct a scheme that once again allows her to defeat all her enemies at once? Or is this really just a tale of nihilism that the harshest critics have suggested, resulting in The Night King laying waste to our heroes and ushering in an Age of Always Winter and Forever Darkness. I’m going to say that none of them will take it. This series is best known for its shocking plot twists, steering the reader into thinking “Ok, this is the hero that is going to save everyone” and then promptly cutting off their heads. Ned, Renly, Robb, Oberyn, etc… the list goes on. Jon is in the most danger here, as the revelation of his magical blood has turned him into a somewhat prototypical fantasy hero. Working for him is that fact that he has already died and come back to life – with it being suggested that this could happen again as many times as needed. I just can’t see Jon having a happy ending here though, the dude was not made for those sort of things. So for Jon I will predict the noblest of noble deaths, inspiring his pregnant girlfriend to abandon her quest for power. This will lead to a splitting of the Kingdoms, as it was before the Targaryens came. Feudalism is on its way out, and will take all the Lannisters with it. So that leaves the Starks, who have no interest in southern things. And of course The Night King, but I just can’t see the showrunners ending on such a downer note. If the Walkers were to win, surely there’d be a season 8 exploring what it is like to live in a world ruled by these monsters? The story can’t have a typical fantasy ending but it cannot have Evil win. Therefore, Dany wins the game but loses her heart in the process and burns the throne in dragon’s fire. 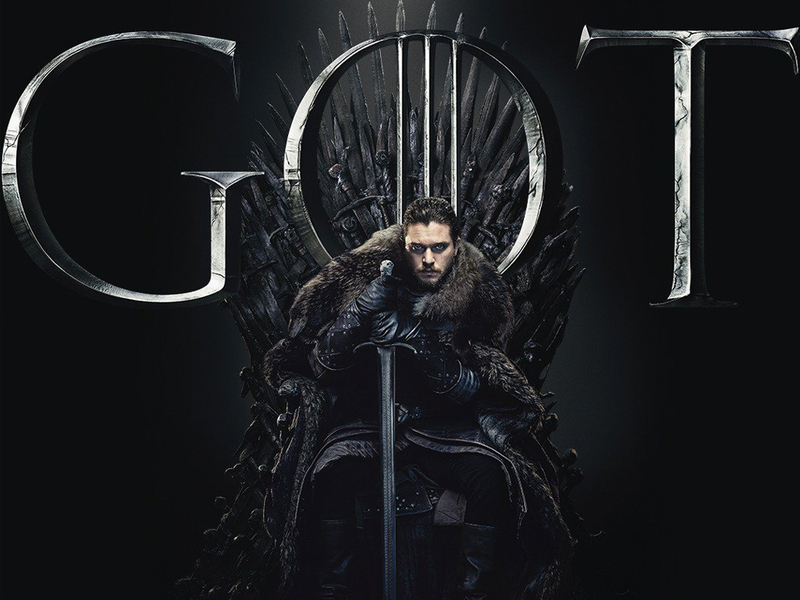 Cersei Lannister, Jon Snow and Daenerys Targaryen are the three key players that remain in the hunt for the Iron Throne as the cultural phenomenon of the early 21st century commonly known as GoT comes to an end. Though I see two more contenders and a dark horse in the race i.e. Tyrion Lannister and Sansa Stark. The dark horse Arya Stark being the youngest and one of the most skilled of the contenders could be crowned but she has delved too far outside and the character never showed interest in leading those armies. Tyrion as well seem to be happy in ministry work whereas Sansa seems content defending the walls of Winterfell. I feel Cersei’s days are numbered though we might see her child survive (and maybe setup a intriguing sequel possibility where he/she tries to claim the throne). Also in the mix is the interesting battle brewing with the horrifying White Riders army and with a dragon on their side this time, though I highly doubt anyone thinks they will win and take over. That leaves us with Jon and Daenerys and among them its a toss-up at this point given what happened at the pivotal last scene of season 7 with the big reveal. Though Tyrion was somehow not happy with this alliance, which might be cause for problems in this season. I’ll go with resurrected Jon (It’s always been about Eddard Stark) being the king with Daenerys (possibly his wife) by his side for the throne, though it will be interesting to watch how they will wrap-up so many stories in this short final season. Game of Thrones Season 8 is going to be good. It’s going to have cool dragon sequences, and characters giving motivating speeches to each other in the hope of faux inspiration. Reviewers will heap praise onto it for these reasons, while ignoring the fact that the show has fallen so far from its original intention: to subvert tropes of fantasy. When the show continued on from the books beginning in season 6, major character deaths and unexpected events became fewer and farther in between. Becoming especially noticeable in the latter half of season 7, audience favorite characters such as Bronn, Jorah Mormont and Tormund Giantsbane were put in unsurvivable situation after unsurvivable situation, but still managed to make it out alive. The show became more and more about dragon effects and action and less about the unpredictable storytelling it was famous for. In season 8, I do believe that the showrunners will continue to cleanse Westeros of minor characters. We may finally say goodbye to characters like Missandei, Bran, Varys and Melisandre. But expect Daenerys, Cersei, Tyrion, Jon, Arya, Sansa, Jaime, Theon, and Brienne of Tarth to all make it to the end of the show’s finale. And expect Daenerys to end up on the throne at the end of the show. She may not get there in the way we may expect, but I do not trust the writers of the show to give us any more daring of a twist. Cersei will be defeated, as will the Night King. All along the most minor of characters will die, but the show will end as a completely different show than it began as. One that values action, spectacle and effects over good storytelling. “Bittersweet” – that’s how GRRM has alluded to the Song of Ice and Fire story ending. I believe it will be no different this coming May when the world finally witnesses who will (or won’t) sit on the Iron Throne as Game of Thrones hurtles towards its conclusion. The “sweet” part leads me to believe that Jon Snow, who after his resurrection and reveal of his parentage will be the one to claim victory over death (the white walkers). He’ll be aided by his better half (Dany) who will likely sacrifice herself to defeat the Night King and his crew. That’s the “bitter” part to the ending. Most of the others will also die, with a lucky few left (perhaps Tyrion, one of Sansa or Aria, Jaime). Cersei will be killed by either Jaime (as most fans would like to see) or Arya (seems the way the show is heading). We’ll get the Cleganebowl we have all been expecting which should be kinda cool. So let’s get to the burning (or perhaps freezing) question – who will sit upon the Iron Throne? Physically, nobody will. Kings Landing will probably be destroyed and so too the Iron Throne. I don’t buy some of the “Night’s King will sit on the Iron Throne” theories out there. I’m sure he’ll be outed as a Stark (and we may get a flashback or two) but he will be defeated. In the end – it’s all about Snow and though he’ll be the “victor”, he and everyone else left will realize that all the petty throne wars were for nothing and they paid the price for ignoring the greater threat beyond the wall. He’ll likely rule (and rebuild) but not want to have anything to do with the Iron Throne itself. The most awaited series finale is upon us. It will be the biggest finale for a drama since the end of The Sopranos and for any TV shows since the end of Seinfeld. Winter is knocking – bring it on. I see Sansa ruling in the end game. Her journey has been one of gaining wisdom, from the naive girl with a princess fantasy to having this illusion shattered and learning how to play the game without letting it overwhelm her values and desire to continue the Stark legacy. She is not Ned Stark who was all tradition and values which blinded him to the game others were playing, but she’s not Littlefinger who was all game without any traditional values to protect. Having learned from both puts her in the best position to come out on top. I predict Jon and Dany will die in battle together, as will Jaime and Cersei die together but after he kills her while he is mortally wounded. Bran will sacrifice himself to take out the Night King in the past. Heartbroken that she wasn’t the one to kill Cersei, Arya will leave and be a wild creature. That leaves Tyrion and Sansa to rule what’s left of the kingdom and raise Jon and Dany’s child. Either Tyrion and Varys will run the South and Sansa will rule the North, or King’s Landing will be ashes leaving them no choice but to do it from Winterfell where Sansa will not want to leave.